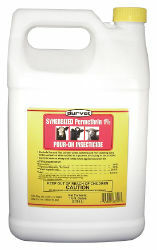 Synergized formula is a ready to use broad spectrum insect control. It can be used on lactating and non-lactating dairy cattle, beef cattle and calves to control lice, horn flies, and face flies. It also aids in the control of horse flies, stable flies, house flies, mosquitoes and black flies. For use on sheep to control sheep keds and lice. For use in and around horse, beef, dairy, swine, sheep and poultry premises, animal hospital pens, kennels and outside meat processing premises to control house flies, stable flies, face flies, gnats, mosquitoes, black flies, fleas, and little house flies. It also aids in the control of cockroaches, ants, spiders, and crickets. Oil based for application for any time of year that can be used as a pour-on or a spray. For Cattle and Calves: Apply 1/2 fl. oz. (15 cc) per 100 lbs. of body weight of animal up to a maximum of 5 fl. oz. for any one animal. Ready-To-Use spray: Use undiluted in a mist sprayer to apply the correct dose. Apply directly to the neck, face, back, legs, and ears. Back Rubber Use: Mix one pint per gallon #2 diesel or mineral oil. Keep the rubbing device charged. Results improved by daily forced use. Sheep: Pour along the back. Apply 1/4 fl. oz. (7.5 cc) per 50 lbs. of animal body weight, up to a maximum of 3 fl. oz. per animal. For optimum control, all animals in the flock should be treated after shearing. Premise Spray: For use as a ready-to-use spot spray or premise spray, use undiluted in a mist sprayer. Apply directly to the surface to leave a residual insecticidal coating, paying particular attention to areas where insects crawl or alight. One gallon will treat approximately 7,300 square feet.